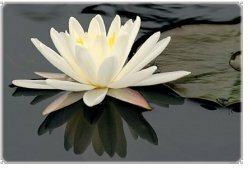 The chakra is symbolized by the lotus flower because the analogy is that from the least likely of physical circumstances true spiritual beauty can triumph and flourish. This analogy also implies that however unclear your own present perception of spiritual awareness, it need not be an obstacle to your ultimate progress because from `muddy' thoughts, sudden clarity and awareness can blossom. Each chakra&apos;s symbol contains a specific number of lotus pedals. The petals indicate the chakra&apos;s vibration frequency rate & the color of energy field. The more petals the higher and finer the vibrational frequency. the petal has got a sound, a quality, a Mantra, etc. The lotus petals of the Chakra works only on the subtle body. A lotus opens only when touched by the morning sun and closes just as the sun sets. Likewise, the lotus of the six Chakras open only when the Kundalini is present within them. So, in an ordinary man all the lotus petals remain closed.